I have received an Outlook Voice Recorder license key. Where do I enter it? I need to convert more than 60 minutes of speech a month to text. Is there any way to increase the limit? 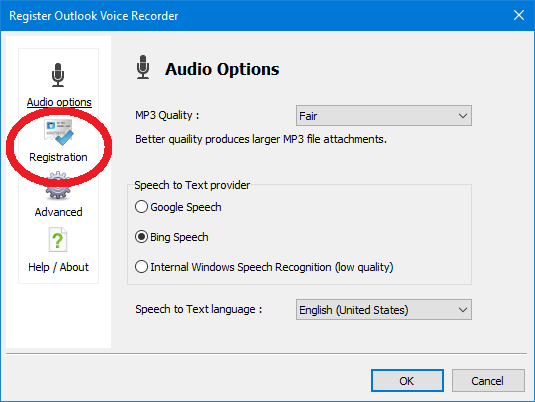 Outlook Voice Recorder limits the conversion length since we have to pay for each second of the speech-to-text conversion performed by Google or Bing. 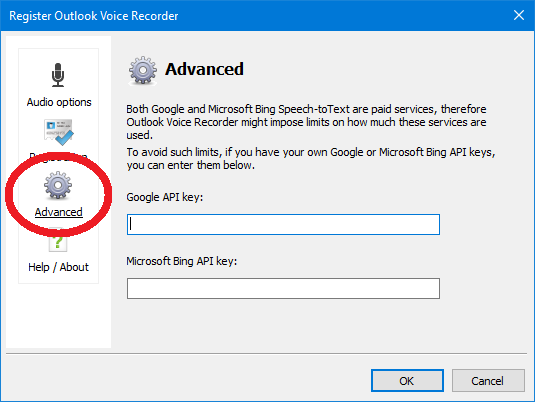 If you already have your own Google or Bing API key, Outlook Voice Recorder will be happy to use it without imposing any limits. 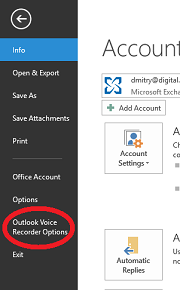 Click Advanced button in the Outlook Voice Recorder Options dialog and enter the API key for Google or Bing. 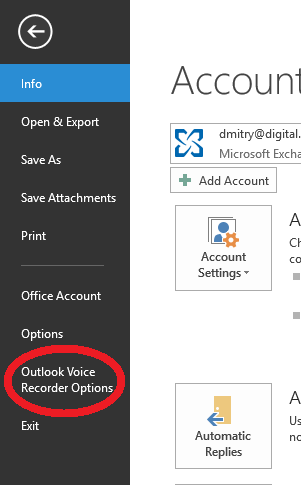 I need to install Outlook Voice Recorder on multiple machines without any user interaction. Does Outlook Voice Recorder installer allow that? You can download the zip file with the dlls, copy the appropriate version of the dll (OutVoice32.dll for a 32 bit version of Outlook and OutVoice64.dll for a 64 bit version) to any folder and register it using regsvr32.exe. No elevated privileges are required - Outlook Voice Recorder installs itself in HKCU if it cannot be installed in HKLM. You can use these dlls to install Outlook Voice Recorder automatically (regsvr32.exe /s) without any user interaction from, for example, a Windows logon script. You can also copy the license key (stored in the RegistrationKey value in HKCU\Software\AdvancedMessagingSystems\OutVoice) to make sure the outgoing messages do not include a footer.